Treasure Coast Hope For The Homeless Foundation began in 2011 after a group of four girls, Karina Del Toro (age 10), Alexandria Del Toro (age 7), Kayliegh (age 10) and Mallory (age 8) decided to help those in need and less fortunate. A poster with the name “Hope For The Homeless” was placed over a plastic bin and over the next few years, clothing and hygiene items were collected at Morningside Church and distributed to other non-profit organizations within our community. However, after deciding to officially incorporate the charity as a 501(C)(3) non-profit organization, a name change was necessary due to other corporations already incorporated with the name “Hope For The Homeless”. Our Team also felt a local area designation was needed within the name in order to generate local interest from our residents. 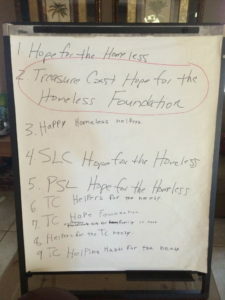 After a full morning of brainstorming, the Treasure Coast Hope Team decided to rebrand the organization as “Treasure Coast Hope For The Homeless Foundation.” Our goal is to collect clothing and monetary donations in an effort to serve families in need and those less fortunate throughout the Treasure Coast of Florida. We will continue to support other non-profit organizations as we believe partnerships with our community and helping others achieve success is critical to achieving our mission.